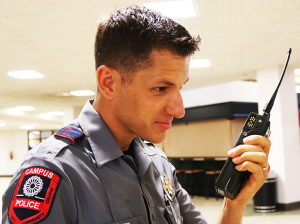 Campus law enforcement officers received funding for more powerful police radios when the Board of Regents met June 16. The regents approved funding to acquire the 800mg Hertz radios at the recommendation of James Fitzpatrick, OCCC’s police chief. Officer Patrick Martino shows one of the new radios received by the OCCC police department. Fitzpatrick said the upgraded radios will reach all of the Oklahoma City metro area, even as far as Purcell. This will include the college’s satellite locations, the FACE Center, 6500 S Land Ave., and the Capitol Hill Center, 123 SW 25th St., Suite 100. “We are leasing 17 used radios from the Oklahoma City Police, and have purchased eight new radios,” Fitzpatrick said. The total cost for the radios will be $3,966 for this fiscal year. The campus police began leasing the radios starting July 1, for a fee of $12.50 monthly, Fitzpatrick said. “This deal will put OCCC in the same frequency as the major emergency responders, such as the Oklahoma City police and fire departments and Oklahoma Highway Patrol units,” Fitzpatrick said. “This is a huge step for the department, and the student body’s safety,” Fitzpatrick said. “The new radios will be connected to local authorities, allowing city cops to respond to campus issues in a more timely manner. Fitzpatrick said he has been with OCCC for more than four years. He has announced his retirement from the college on Jan. 4. Fitzpatrick was with the Oklahoma City Police for 35 years, and served as director of the 911 department for two years. He said his 11 police officers are certified officers, who completed training through the Oklahoma City Police Academy, Norman Police Academy, or Texas Law Enforcement Training programs. For more information, contact Fitzpatrick at 405-682-7861 or by email at jfitzpatrick@occc.edu.